Your journey to healthier looking skin begins with an assessment on our 7th Generation VISIA Complexion Analysis System. 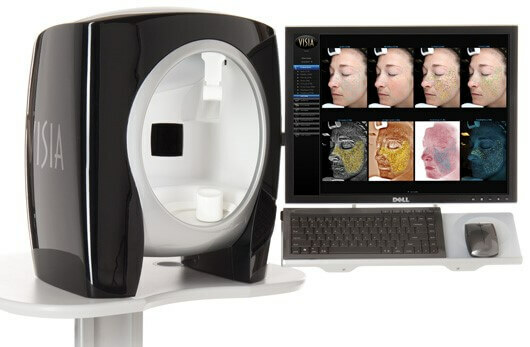 This machine comfortably captures a series of images of your entire face, measuring sun damage, bacteria, pore size and other factors that can affect your skin’s texture and appearance. Once we have a clear picture of your skin’s condition, we’ll tailor a regimen specific to your needs. You’ll get a comprehensive report that shows how you compare with others your age, and a list of recommended treatments and products to get you looking your best. We’ll also keep a record of images over time, so you can see your progress! Sometimes skincare issues come back to a hormonal imbalance or medical issue. Our medical aesthetician is trained to notice these and consult our physician if further testing is necessary. Just like within our wellness realm, we want to get to the root of any issues with our client’s skin too. Renew’s signature treatments include a wide range of facials, microdermabrasion, chemical peels, dermaplaning, as well as IPL and laser hair removal treatments that are all tailored to your skin’s specific needs. Renew offers three- and six-month signature skin care packages, along with a la carte services. These also make amazing gifts! This 35 minute facial is perfect when you need a quick refresh! This facial hydrates the skin and leaves you with a bright glow and fresh, healthy look. Who is this perfect for? The person on the go, who is just looking for a quick pick me up! This is our signature facial! During this 50 minute facial you get to totally relax while our medical aesthetician gives your skin a deep cleanse using organic Nelly De Vuyst products. You leave feeling like your skin is RENEWED! Who is this perfect for? This is a great “starter” facial for the person who’s never had a facial or just wants a deep cleanse of the skin. This is a 50 minute facial. The focus on this is hydrating the skin to the point it LIFTS! Who is this perfect for? Someone with mature, loose skin looking for instant lift. This is the facial we advise for client’s looking for that extra glow before an event! This is a 50 minute facial. Vitamin C is a powerful antioxidant that creates a brighter, smoother, more youthful complexion and helps fight free radical damage. During this facial you get a deep cleanse and hydration with Vitamin C products. Who is this perfect for? Those with dull, uneven tone and texture. This is not suitable for those with sensitive or acne skin. This is a 45 minute facial. This is a very deep cleanse that targets those with acne prone skin. Only sensitive skin products are used to clean and hydrate the skin while you sit back and relax. Who is this perfect for? This is great for anyone who battles with acne and needs a good cleanse and hydration. The back can be a huge problem area for people- considering it’s not easy to reach! We offer a 45 minute back facial that includes exfoliating the skin and doing any extractions. Who is this perfect for? Anyone who wants to target blemishes, acne and pigment issues on the back. This is a 60 minute facial. We noticed a need for a facial that can treat oncology patients, so we created one that is hypersensitive and works to add in hydration to dried skin caused by medical treatment. We do NOT use any steam during this facial. Who is this perfect for? If you’re a current oncology patient with dry, flaking skin- this is perfect! We have a great line of products that align with this to keep your skin hydrated away from the facial too! This is a 60 minute facial. Microdermabrasion is a minimally abrasive treatment that uses a spray of microcrystals to gently exfoliate the skin and draw out debris and impurities with suction. This is combined with a hydrating facial so you leave with a fresh glow and the microderm helps thicken your collagen resulting in a younger looking complexion. Who is this perfect for? Anyone looking to reduce or eliminate enlarged pores or who has an issue with blackheads. This is a 60 minute facial and treatment. Dermaplaning is a highly effective exfoliating treatment using a surgical scalpel to gently scrape off any dead skin cells on the surface of your skin along with any peach fuzz on your face. This treatment is combined with a hydrating facial so you leave with a silky, smooth, fresh face! Who is this perfect for? This is a staff favorite! Although makeup goes on so smoothly post dermaplane, your skin will look so fresh you won’t care to wear any makeup. This is great for those with sun damage, very dry skin, dullness and/or fine lines. We do not recommend this facial for anyone with inflamed acne. 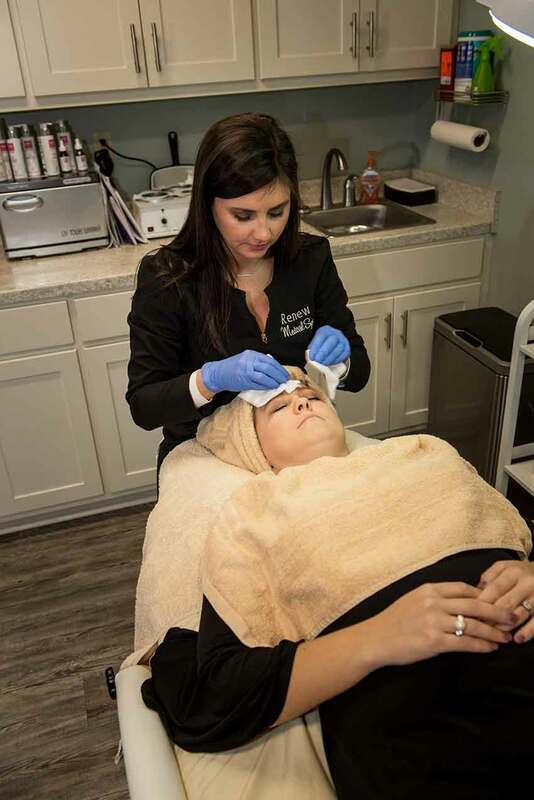 This is a 30 minute treatment where our medical aesthetician cleanses your skin and then uses a surgical scalpel to gently scrape off any dead skin cells on the surface of your skin along with any peach fuzz on your face. Who is this perfect for? This is also great for someone pre-chemical peel and can be combined. Our medical aesthetician can work with you in creating a facial specific to your skincare needs!